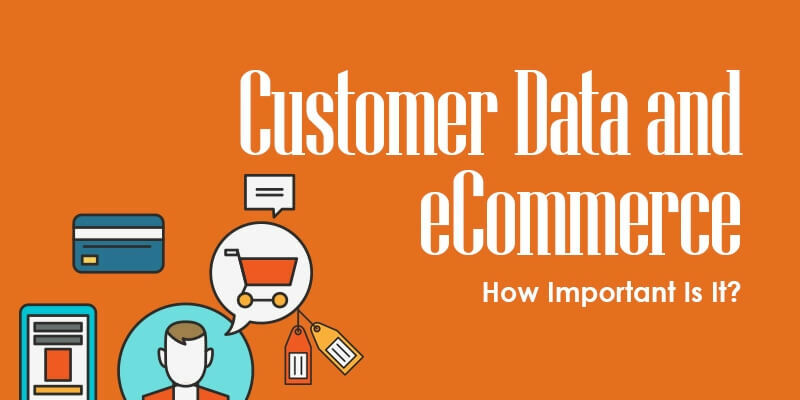 Customer Data and eCommerce - How Important Is It? Both in-store and online businesses collect customer data for a variety of reasons. Collecting customer data allows a company to enhance a customer’s s=hopping experience, making the customer more satisfied and increasing the company’s revenue. In short, it benefits both the business and the consumer. The benefits of collecting customer information are vast. One benefit of having this data is that it allows businesses to give shoppers a more personalized shopping experience by understanding their likes and dislikes. In addition, businesses can learn from their past mistakes from customer data and make their business better for future customers. There are some drawbacks when it comes to collecting customer data. For one, consumers have a fear of releasing any information about themselves to businesses. This can make acquiring information difficult in some cases. In addition, eCommerce sites must be able to handle this information appropriately and assure consumers that their information is secure. Offer incentives: A business may offer a discount to consumers who share their information. Explain the benefits: Ask the consumer to take a survey in order to receive more personalized recommendations. The consumer is more likely to take the survey because they know it will benefit them. Give them the power to opt out: Many businesses allow users to opt out of email subscriptions and give them control over their information so that users will feel more comfortable sharing it. Monitoring the traffic of your eCommerce website is something that every successful website does so that they can see how well their site is performing. This means that eCommerce business owners should be noting how many visitors their website is getting, how long they are staying on the site, and where exactly they are losing business. Bounce rate: The amount of visitors to your website who leave the site after viewing only one page. Absolute unique visitors: The amount of visitors to your page that have never visited before. This is based off their IP address in order to differentiate between returning visitors. Direct traffic: Those who visited your website by typing in your website’s name into the web browser. Referring sites: This refers to other websites that are linking to your website. The visitors are clicking on the link from the other website and it takes them to your own website. Search engines: The visitors that found your website from search engines such as Google, Bing, or Yahoo. Keywords: Particular words or phrases that describe the content of your page and which also help search engines match pages with searches. Pages: This tells you the amount of page views that your website has for every webpage. This remains the single most important factor upon which the success or failure of your eCommerce business rests. Big Data helps you understand your customers better – The products they like, why they leave their carts without paying, the times of the day and the months of the year that see the most customers, and a variety of other salient business decisions. You can plan your marketing campaigns around this – A practice known as behavioral targeting, or behavioral marketing – to maximize conversions.Examples include sending personalized emails with discount coupons to customers on their birthdays, targeted pop-ups informing customers of seasonal offers and so on. Big data and behavioral targeting tools are gaining popularity – And we’ve got one ourselves. Our new SaaS personalization tool, Targetbay, offers comprehensive personalization and in-depth analytics that you can use to target customers based on their on-site behavior, demographics and a variety of other metrics. Customers like to see discounts, recommended products, and most importantly, they love a personal touch. This is impossible without data: What they tend to buy, how much time they spend browsing through products, how much they spend per transaction, how often they visit eCommerce sites, how often they abandon their cart and a myriad other bits of information. It’s been found that close to 68% of visitors tend to leave websites because they aren’t happy with the customer service being offered. Using Big Data, you can coordinateand synchronize multiple communication channels –Emails, phone callsand live chat, if applicable. Big Data is crucial to understanding recurring issues and fixing them immediately. With enough data, customers can be gauged for their spending patterns and on-site behavior. Once personas are attributed to customers, prices can be varied to entice them back to the site, were they to leave. Dynamic discounts are a powerful toolbutare only successful when executed with enough data. This has been one of the most effective customer retention strategies todate. You can use Big Data to understand not just your customers, but how your entire business is doing: Stocking, shipping, inventory and sales. This gives you the sort of bird’s eye view that you can use to forecast future cash flows, Gross Merchandise Volumes, customer acquisition rates and other parameters crucial to the success of eCommerce businesses. Web analysis tools can be used to not only increase a business’s sales revenue, but to also create a better experience for the customer. In order to remain competitive, it is vital that every eCommerce site acquire basic customer data and understand their web analytics.